You are at:Blog»Beep Promos»LOVE MONTH BEST CAR SHOP PROMOS! It’s finally the second month of the year! You know what that means, it’s the “Love Month” already. Who said that February is only for couples? There are other ways to share your love, whether it be for yourself, for your significant other or even for your car! 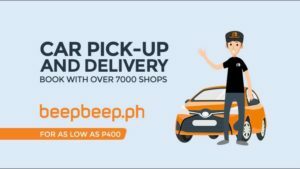 Different shops around the metro are serving up some good deals for this month which are hard to resist, luckily we at beepbeep.ph compiled the best of the best car shop promos this February! Is your name Love, Lovelyn, Heart? Or do you celebrate your birthday on Valentines? Well, you’re in for a great treat this month! 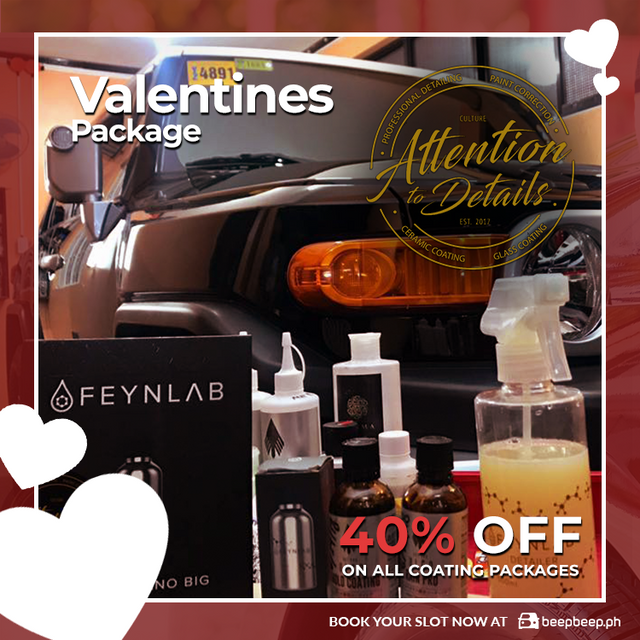 Simply present your valid IDs and avail of the exclusive 40% off on all coating packages from Attention to Detail so that you can get a great deal. Make your car is as romantic as it gets for your perfect Valentines date. What’s better than one promo? Two promos, duh! You heard it right! 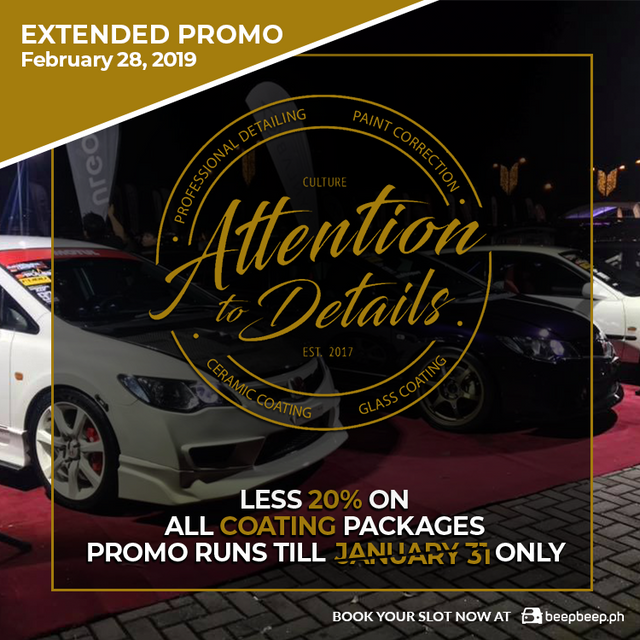 Attention to Details is extending their January promo till February 28. Promo does not apply to other existing promos. Check out Attention to Detail at our app or website and visit them at their shop in Pasig. 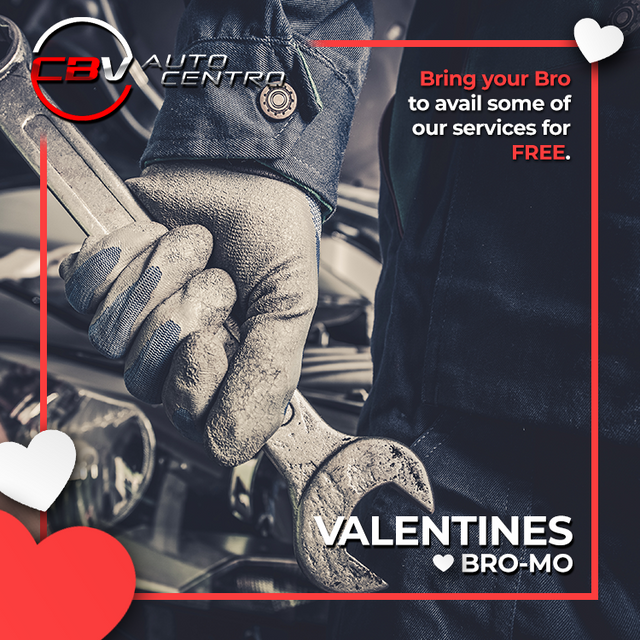 Develop that existing BROmance this Valentines with CBV Auto Centra! Have your cars’ brake cleaning, Oil Change or Tune Up and if you bring your friend’s car with you they’ll have the same service for FREE. Book now through beepbeep.ph and visit them at their shop in Quezon City. Now that’s a BROtastic deal! 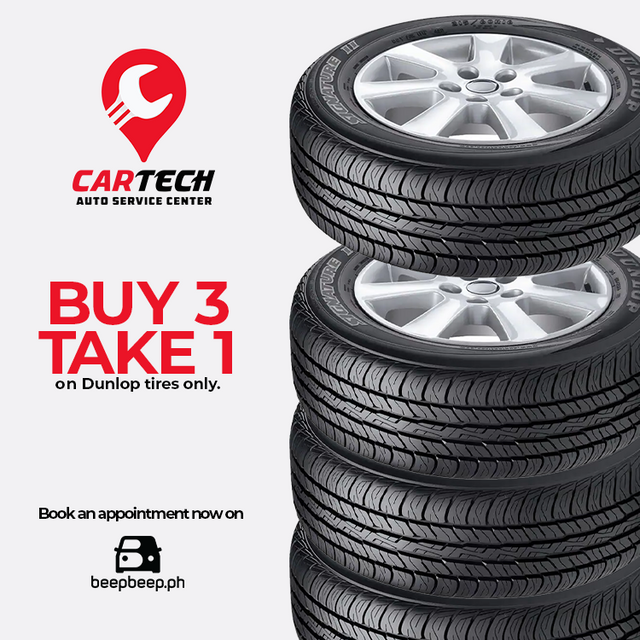 As seen last month on our blog as well, Cartech Auto Service Center’s Buy 3 Take 1 promo on Dunlop tires are still ongoing. Better go to Cartech ASAP and avail of this deal before supplies run out! What could be better than a discount? A discount on car stereos! Founded on 2014 by the Navlani Family, Electrovox has become one of the most visited and most trusted parts and accessories shop in Evangelista, Makati. 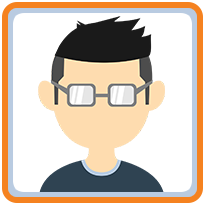 With lots of competitors in the area, Electrovox stands out by giving the best deals and making sure that the products they sell are of the best quality. Electrovox Enterprises is offering a special package promo! 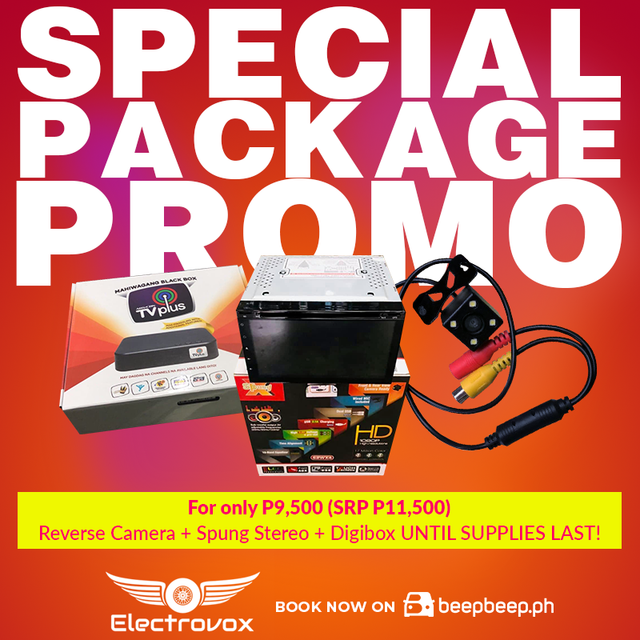 This package includes the Spung stereo, a reverse camera, and a black box all for P9,500 (from an SRP of P11,500). Now that’s an awesome deal so make sure to book now! You heard it right! Active Brothers Autoshop’s tint promo is still in full effect. The shop that would take you long distance, Active Brothers Autoshop, is still offering their special tint promo. 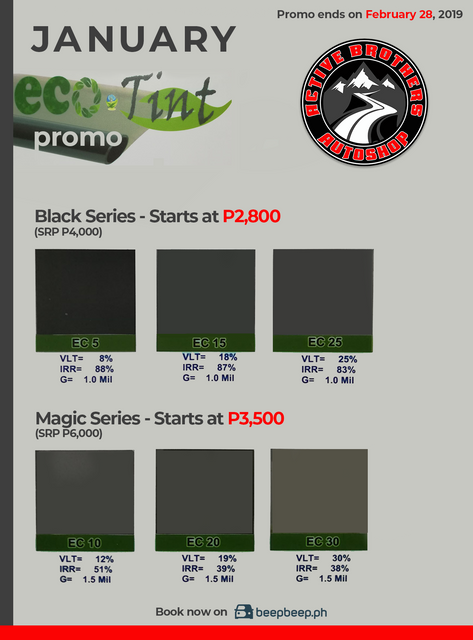 Get tinted starting at P2,800 for the black series and P3,500 for the magic series! What are you waiting for, we’re pretty sure you’re going to need them this love month **wink wink ! Missed out on last month’s promo? Don’t worry! Value Plus Auto Service’s is still offering their promo! Have your first PMS at any branch of Value Plus Auto Service and get the next one for FREE! What’s good with this is that Value Plus Auto Service has two branches, one is in QC and the other one is in Las Piñas City. So whether you’re from the North of from the South, Value Plus Auto Service will be there for you! ValuePlus Offers New Service: VP PRIME – The Future of PMS is here! Now what are you waiting for? Get your gears ready for the month and go get these best car shop promos before your dates or your night outs! 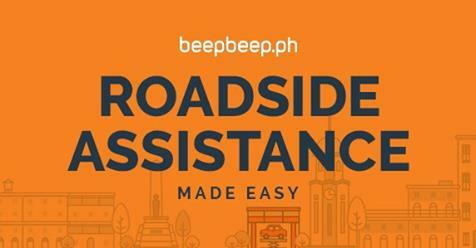 Lastly, book an appointment from your favorite shop via beepbeep.ph or if you just don’t have the time, book our maintenance valet service and let our professional and capable drivers take your cars to your favorite shops! Trust us, it’s the ultimate VIP treatment! Monthly Car Shop Promos You Should Always Check for big discounts!